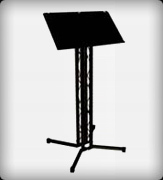 Looking to hire a Powerpoint projector in Edinburgh? For most presentations, powerpoint projectors are connected to a laptop/notebook computer. Most modern laptops have VGA connections. (these are normally 15-pin connections and are blue in color). More modern laptops have a DVI connection, this is of HD standards. ( usually white and is a little wider than a VGA). The powerpoint projector you want to hire will depend on several factors, including; connectivity, picture size needed and brightness required. We can provide solutions for any budget and client requirements. 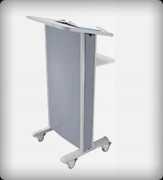 If the powerpoint projector is to be connected to a desktop/tower PC, then we can provide longer leads. Our projectors and screens are capable of both 16:9 and 4:3 ratio's so they can easily show both standard and wide screen presentations to their full potential. This is our basic presentation kit for clients on the move who are going to a boardroom / meeting room but requires a projection system without screen. easy to carry, very portable for any mobile business person. 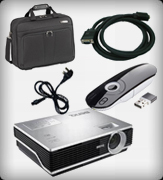 This includes: Projector, wireless clicker VGA lead and power lead. 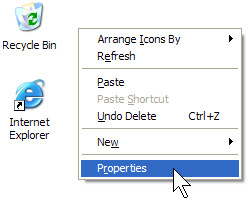 Our clickers auto install and work plug and play with OSX and Windows using USB. It comes with a spare battery and laser pointer built in. This presentation kit gives our clients a perfect solution for any boardroom / meeting room that requires a projection system with a screen. The basic screen provided with the package as standard is very simple to set up, easy to carry, very portable for any mobile business person. 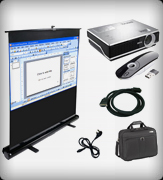 This includes: Projector, wireless clicker VGA lead and power lead, basic projector screen. 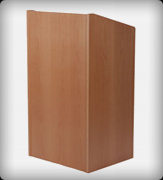 This presentation kit gives our clients a perfect solution for any boardroom / meeting room that requires a projection system with a screen and a professional sounding speaker system to compliment the sound during the presentation. The basic screen provided with the package as standard is very simple to set up, for any business person. 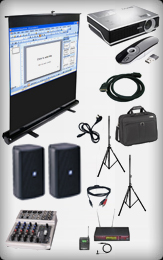 This includes: Projector, wireless clicker VGA lead and power lead, basic projector screen. 2x Professional Powered Speakers and stands, audio lead for the laptop. Remember the sound system can be used for background music before and after your event to create an atmosphere. 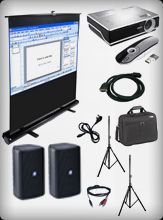 This presentation kit gives our clients a perfect solution for any boardroom / meeting room that requires a projection system with a screen and a professional sounding speaker system to compliment the sound during the presentation and a wireless microphone system to re-inforce a presenters voice, an added vocal mixer is used to provide proper eq for any vocals. The basic screen provided with the package as standard is very simple to set up, for any business person. Wireless microphones give presenters the freedom to move around naturally without fear of pulling cables. Mini-VGA: This is found on iBooks, eMacs, and some of the iMacs. Mini-DVI: If you've bought a Mac recently, chances are good you'll have a Mini-DVI connector. DVI: Many newer Macs, especially the higher-end Macs, have DVI connectors. VGA: Many popular projectors have VGA connectors. 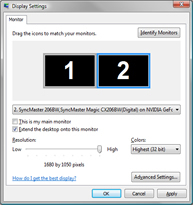 Click the Display list and select your external monitor. 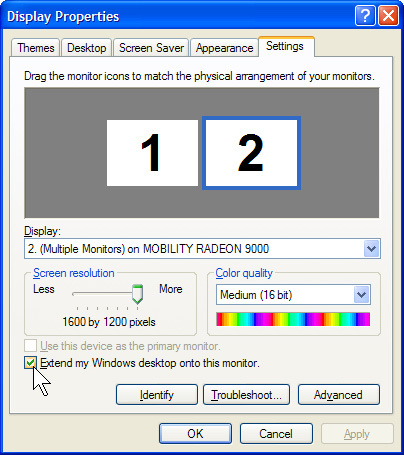 If you do not see multiple monitors listed, your computer hardware may not support Dualview. Contact your computer manufacturer for more information. 3.Just hit Apply. The screen should flash and you are done!